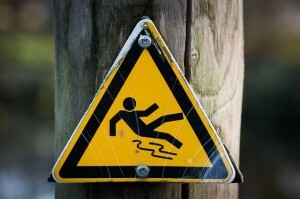 Best Ways to Avoid an Arizona Slip and Fall Accident | Phoenix Personal Injury Law Blog - Breyer Law Offices, P.C. Debris, wet floors, raised carpets – there are far too many opportunities to have an Arizona slip and fall accident. So how do you avoid these incidents and just enjoy your day? Nobody wants to stay inside their whole lives just to avoid the possibility of being injured in an accident. Besides, there is the whole world to enjoy. Rather than live in fear, why don’t you check out this list of easy ways to protect yourself from a slip and fall accident this year and every year? You can use them every day to go through your days without worry. When you’re headed out to the grocery store, the department store, or another location that is likely to have linoleum or slick tile flooring, make sure that you prepare yourself. But what does this mean? When it’s raining outside, other customers are likely to track water into these establishments, making the floors slippery. So you’ll need to keep your eyes open. And don’t forget to bring your tennis shoes: a good pair with rubber soles. Pace yourself and give yourself time to do the errands you’ve got to do. Whether you’re getting gasoline, walking through the department store to grab new towels, or grocery shopping, everything takes time. And you know better than anyone that your time is precious. That’s why you try to make everything go a little faster than it probably should. Try to better manage your errands and time so that you don’t have to rush. When you can move more slowly through the stores you visit, you’re less likely to trip, slip, and fall. Use the elevator instead of the escalator if there’s an option, and make sure the escalator is in proper working condition before you get on. Many slip and fall injuries happen to people who get tripped up on escalators. Remember, your safety is always what matters wherever you are, but store managers and maintenance workers might not always make it to a problem area before you do. Keep yourself and your safety in check at all times.